Are you looking to add some serious stability to your electric Rustler or Stampede 2wd? Look no further! RPM has a new set of wide front A-arms that will push your front wheels out there almost 1-1/4” (31.8mm) of total width for some serious stability-adding performance. Our Wide Front A-arms extend the front width by exactly the difference in offset between the front and rear wheels. All you need to do is get a second set of “front” wheels and bolt them to the rear to align the front and rear tires and you’re good to go! No expensive prefabricated widening kits or time-consuming conversions. It’s as easy as replacing your stock A-arms with RPM wide A-arms, swap the turnbuckles and camber links for longer versions (not included see “Tech Notes” below) and bolt on a new set of rear wheels! It couldn’t be easier. You already know RPM A-arms are the toughest molded a-arms in the R/C industry (gram for gram, stronger than aluminum as well)! Each RPM A-arm is molded from our trademark blend of nearly indestructible nylons and backed by our world-renowned limited lifetime warranty against breakage. RPM durability combined with RPMaffordability; there’s no way you can go wrong! Rustler XL-5: 1 – RPM Screw Kit #70680, 1 – Traxxas #3643 (long camber links), 1 – Traxxas #3645 (long toe links) & 1 pair of front wheels (used to replace rear wheels). Stampede XL-5, Craniac & Skully: 1 – RPM Screw Kit #70680, 1 – Traxxas #3643 (long camber links), 1 – Traxxas #2338 (long toe links) & 1 pair of front wheels (used to replace rear wheels). Rustler VXL: 1 – Traxxas #3643 (long camber links), 1 – Traxxas #3645 (long toe links) & 1 pair of front wheels (used to replace rear wheels). 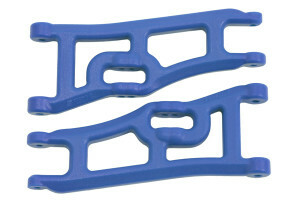 Stampede VXL: 1 – Traxxas #2338 (long toe links) & 1 pair of front wheels (used to replace rear wheels).